For a while now I’ve been experiencing vampire fatigue as everything I tried lately was of the same. 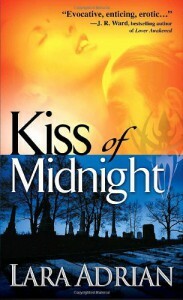 I was completely set to read a different book when Kiss Of Midnight’s cover popped up in my vision. I bought it when it was released and kept buying each new release in the series as they came but never read one of them. Now however, Kiss Of Midnight didn’t let me go as I wondered what this series and story had to offer. So I put the other book down and cracked the spine of Kiss Of Midnight. What I found was a story that pulled me in from the first chapter and let me into a world that was fascinating. The vampire lore given by Lara Adrian had me jubilating, it felt fresh and exciting and full of possibilities. The origin of the vampires, the Gen Ones, the Ancient Ones, the Bloodlust, it all stirred my enthusiasm for sound world building and Adrian was checking them off, one by one. Next to the Lore there were also customs and rituals which tugged at my heartstrings. Sometimes it was a rite full of symbolism that moved me and sometimes it was utter brutal, but each element of this world was drawing me in and making me a part of the whole. While I was absorbing the detailed world there were also plenty of dangers and mysteries to deal with. The vampire and Rogues are heading towards a war that will ask many sacrifices. While the twists and turns of the mystery kept me succumbed even more it is the characters who made me feel it all. Lucan Thorne is the head honcho of the vampire warriors and close to the Bloodlust. He is a vampire who makes me tingle all over; commanding, virile and on the verge of going to the dark side. 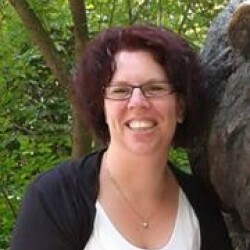 Gabrielle Maxwell is a leading lady in the dark regarding an essential part about herself. She is creative, loyal, vivacious and also guarded. Of course there are more warriors and each was introduced with enough characteristics to make them stand out. I personally was falling very hard and fast for Tegan and Gideon. The romance is one of the things that felt almost standard romance development. Lucan meets Gabrielle in personal trying times and he tries to resist her lure. Gabrielle gets more and more confused by all the signals she is receiving of another world yet simultaneously feels the attraction burning fierce for Lucan. Together they have a titillating push-pull between their desires and personalities as the plot steers them to dangers and secrets revealed. It is a romantic formula I enjoy but it wasn’t completely up to par with all the other exciting elements I was getting in Kiss Of Midnight. There was also a dreamlike sensual scene which I’m not a fan off and it made me initially worry if the romance would work for me. That was quickly put to rest though and what made it good for me was the solid build-up of the physical and emotional connection humming between Lucan and Gabrielle. It convinced me of their budding love, it made me understand the risks involved and understand the choices made. It may have been romance 101 but Lara Adrian took it to heart and made it her own via a distinctive leading couple who felt a range of emotions together. When the ending neared the action and mystery amped up and delivered a cliff hanger that made me instantly hunger for the next novel. I was riveted to the pages, couldn’t believe all that was happening but it was happening all the same. The overall plot arc contains lots of promise and I can’t wait to see where Ms. Adrian is taking it all. My anticipation is high with the calling card delivered in Kiss Of Midnight. With the last page read all I can say is that sometimes you find books on your shelves that rekindles the fire for a certain genre, Kiss of Midnight is one of them! To top it all off, she was half in love with the darkest, deadliest, most emotionally closed-off man she’d ever known. Who just so happened to also be a bloodsucking vampire. And, what the hell, since she was being honest, she wasn’t half in love with Lucan. She was full-on, flat-out, head-over-heels, never-going-to-get-over-this-one, in love with him.